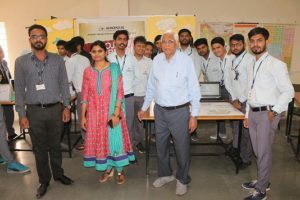 An exhibition of Final year projects was held at Advance Surveying Lab (111) in CE department on 20th November 2018. The students showcased their technical skills and demonstrated the working of their projects to the faculties of different departments and experts. Students had developed these projects using different streams of Civil Engineering including Waste Water Management of AITR, Traffic problems near IT part to Bhawarkua, Using Rice Husk in place of fresh concrete to increase economy, Rainwater harvesting of AITR, Solar electrification of AITR etc. Prof M K Dube Sir ( Vice Chairman AITR ), Dr S C Sharma Sir ( Director AITR ), Dr Kamal Sethi Sir ( HOD, IT) , Dr Uday Chandrawat Sir ( HOD, EC ),Dr Amit Kumar Marwah Sir, Dr B. S Chaurasia Sir and Prof Umesh Bhatia along with our Head of the department Dr S K Sohani Sir appreciated the work done by the students and encouraged for further improvement.